Kent Contreras, with the Forest Service, helps oversee a recent wildfire training exercise near Usk, about an hour north of Spokane. Rain trickles from the brim of Emily Harpel’s yellow firefighting hard hat as she swings her arms, scooping and looping 100 feet of fire hose unraveled out ahead of her. She’s learning to “flake” loose fire hose, collecting it back into a neat coil. Fellow firefighter recruits flake alongside her, their arms like windmills as they reel in their mud-soaked hoses. A 21-year-old Yakima native, Harpel laughs nervously as she works to keep the hose looped properly over her shoulders. Walking the row of recruits, Greene offers instruction and encouragement to each young firefighter. More than 40 first-year firefighters spent last week near Chewelah, undergoing basic guard school wildfire training in preparation for the coming fire season. 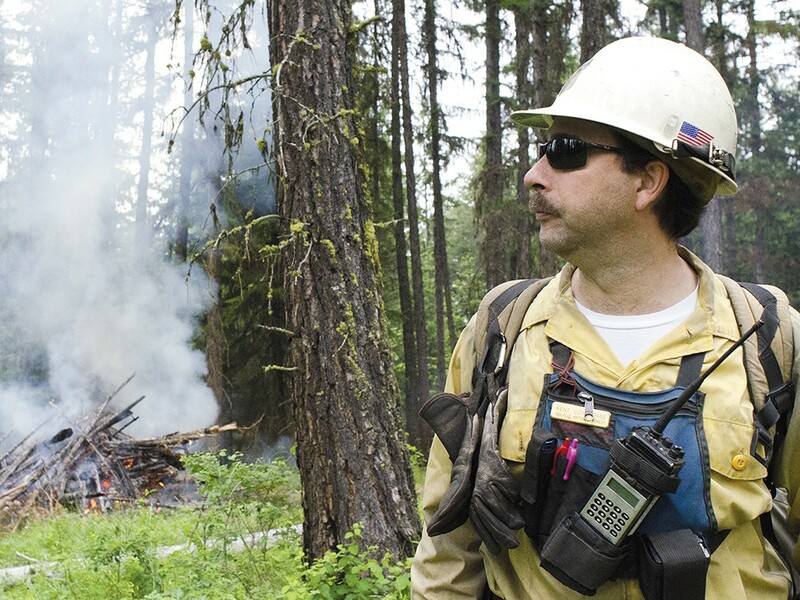 Multiple agencies, including the Department of Natural Resources, the U.S. Forest Service and other departments, come together to battle forest fires throughout Washington each summer. Hundreds of seasonal firefighters — usually college students on summer break — get training to take on wildfire. In the weeks leading up to peak fire season, agencies finalize their staffing levels, equipment maintenance and joint training. Forest Service spokesman Troy Kinghorn says agencies will also ramp up monitoring of weather forecasts, humidity and ignition conditions throughout the summer. Kinghorn says previous warm weather in May had fire officials worried about the high potential for an early outbreak of wildfires. Now dripping wet under a steady drizzle, he says recent rains will probably push back fire season by at least a couple weeks. The National Interagency Fire Center, based in Boise, put out a seasonal forecast for “above normal” fire potential for much of south-central Washington and western Idaho starting in July. The heightened fire danger likely will continue into August and September. State and federal fire crews may also have to get creative with staffing as they work to maintain personnel levels under tighter budgets this year. The Forest Service announced earlier this month it would hire 500 fewer firefighters this year as a result of the sequester and other budget cuts. “It’s a continuous battle with budgets, state and federal, every year,” Kinghorn says, adding individual crews will have to adapt to fewer people covering the same areas. Regional DNR spokesman Guy Gifford says agencies will also coordinate aircraft deployments and other advanced resources as the season progresses. But for now the focus is training. At the Chewelah guard school, Harpel and the other recruits keep practicing their flaking. They learn to operate water pumps and light controlled fires. They take exams on escape routes and fire behavior. At the end of the day, the sore and soaked recruits get to dig their first fire line — a strip of bare soil that cuts off fire from new fuel. It’s often grueling work, but they load up with shovels, axes and other tools to carve their trail. The new recruits head into the trees for their first real taste of the hard labor they will be doing all summer. They march single file, tools over their shoulders.